A cute little girl in a frilly white dress poses for her portrait at the Gluck Auf studio in Malstatt-Burbach, Prussia. The girl is holding a bouquet of flowers and has a ribbon in her pretty curly hair. She is also wearing flowers in her hair. 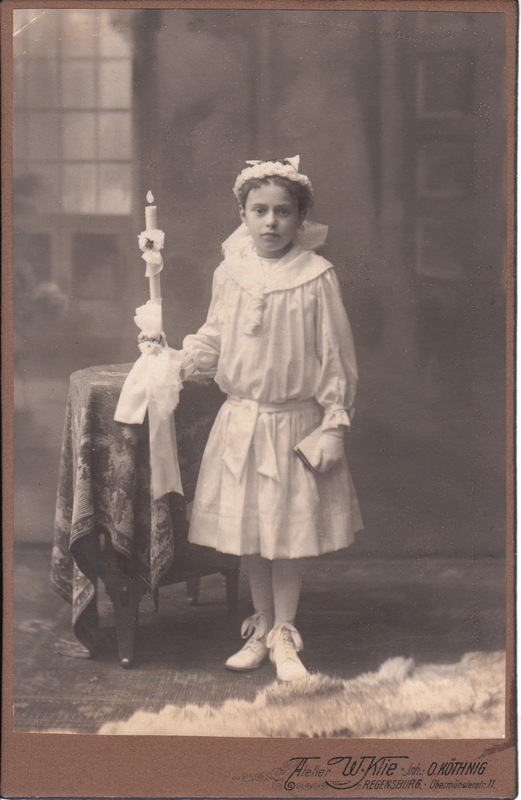 This carte de visite may be a communion photograph. She is standing in front of a backdrop with a simple rural scene. The studio’s home of Malstatt-Burbach was combined with two other towns in 1909 to form the city of Sarbrucken. In 1900 the town belonged to Prussia. A young girl poses for her photograph creating a memory of her participation in a religious ceremony. Is the event a communion, or possibly a confirmation. This pretty girl is holding a prayer book and a lit candle. She is dressed in all white and wearing a pair of gloves. The photographer is Walter Klie whose studio was located in Regensburg, Germany.